During the summer months, as each local crop hits its stride and begins to fill the market stalls to overflowing, I am never surprised when consecutive blog posts seem to be variations on a theme (corn.... tomatoes.... summer squash.... etc.). I don't expect this kind of thing to happen in the dead of winter. But so far this year, that's exactly what seems to be happening...although not with fresh produce.... Last month turned out to be the month of Aidells Roasted Garlic & Gruyère Chicken Sausage. This month looks to be the month of Ricotta cheese. After today, I will be two for two this month. First gnocchi, and today....cookies. It was just a year ago when I first became acquainted with the soft ricotta cookies I'm sharing today. This is surprising. They are without a doubt the kind of thing I should have grown up on. 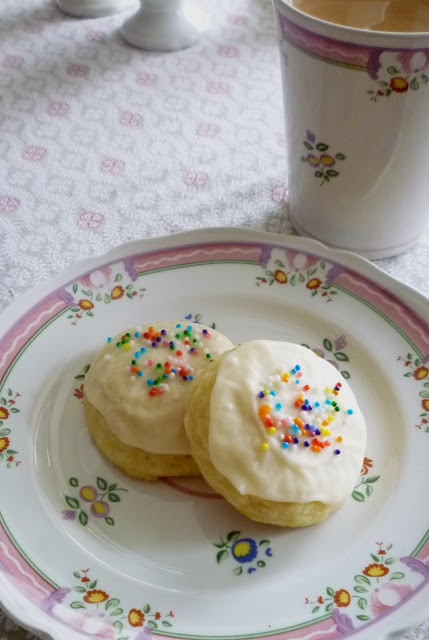 They look just like something that would come out of a grandmother's kitchen (I ate lots of soft, frosted, drop cookies at my maternal grandmother's house). But more than that, they are apparently a traditional Italian-American baked good....and my home town has a large population of people with Italian-American roots. I'm certain many of the family owned bakeries around town would have sold their own versions of this cookie. Since I've always been a bit of a Cookie Monster, I don't know how I missed them. Recipes for this cookie can be found all over the web, and they don’t really vary too much from one to the next. I am passing along the one I like best. 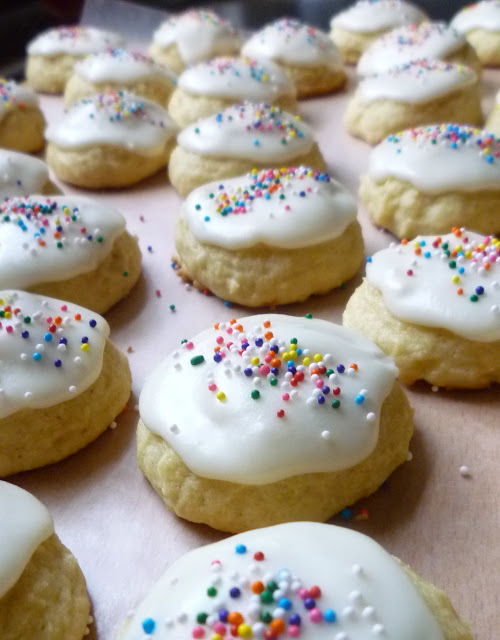 I have adapted it slightly in order to suit my preference—the first bakery version I tried was fragrant with almond, so I have omitted the orange zest and added almond extract to the cookie and the icing. If you look around a bit, you might find a version that appeals to you more. Maybe it would be a good idea to sample more than one variation—to compare and contrast. If you have never had one, I think you will find that you will want to become better acquainted with this tender and delicious little cookie as soon as possible. In a medium bowl, whisk together flour with baking powder, baking soda and salt. Set aside. In the bowl of an electric mixer, briefly cream together butter and sugar until smooth. Add the eggs one and a time, beating until fully incorporated and scraping down the sides. Add the vanilla and almond extracts and blend in. Add Ricotta cheese and mix until smooth and fully incorporated (the mixture will probably look curdled). Add the flour mixture and mix on low speed until the ingredients come together to make a soft dough. Chill the dough for an hour or two. Drop the dough (see note) onto a parchment-lined baking sheet leaving at least 2 inches between the mounds of dough. Bake in a preheated 350-degree oven for 10 to 14 minutes (this will depend on size of cookies and your oven so keep an eye on them). Cookies will just be started to get lightly golden around the bottom edges. If you press them lightly they will feel tender, but they will spring back. Be careful not to over bake—you want them to remain soft and cake-y. Slide the parchment off the baking sheet and onto a rack. Repeat with all of the dough. While the cookies are cooling, make the glaze: Mix together melted butter, powdered sugar, heavy cream, and extracts in a bowl until smooth and no lumps remain. Add additional splashes of milk or cream if you want a thinner glaze. You don't want it to be so thick that it will tear the cookies...but also not so thin that it runs off of the cookies. When the cookies are completely cool, spread with the glaze and add colored sprinkles of your choosing. 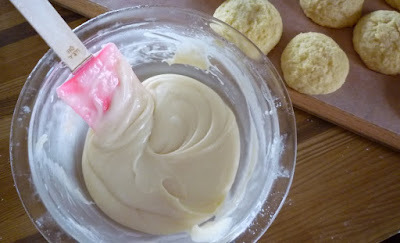 Allow the glaze to set before storing air tight (separate the layers of cookies with parchment or waxed paper). Note: You may make these cookies in the traditional manner of drop cookies by simply dropping mounds of dough from a spoon onto the baking sheets...or you may use a cookies scoop. I like to use a scant half tablespoon sized scoop (about 20 grams of dough)...but they are traditionally made larger. It doesn't really matter what size you make them, as long as they are all the same size (so they will bake evenly). Depending on the size you make them, you will get 4 to 7 dozen cookies. These look delicious! I love almond flavored cookies so I will definitely give these a try. Looks like I need to stock up on ricotta! Thank you! If you like almond baked goods, you'll probably really like these! I made the dough for these last night and then realized that there is nothing about oven temp in the recipe (that I see). I am going to assume 350 but if you could add it, that would be great. Thanks! Elissa, Yes!! 350. I do apologize! Thanks so much for saying something. I really appreciate it! Thanks so much! 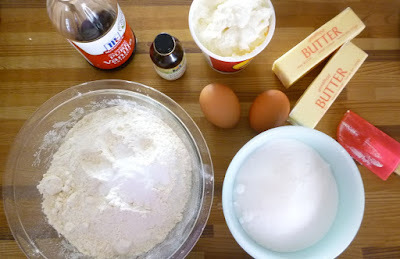 Looking forward to baking them tonight - what a great way to use up some ricotta that's been hanging out in the fridge. Beautiful, Paige! I will definitely make these! Thank you Bonnie!! You'll have to let me know how they turn out!